ABR Imagery, Inc. What is the best adhesive for the job? - ABR Imagery, Inc.
ABR Imagery, Inc. / Glass Blowing / What is the best adhesive for the job? Like all inquisitive craftsmen, I have asked myself this question time and time again. Although the answer may not be as straight forward as we’d like, I am happy to inform you that many options exist today for gluing glass. In our first case, you have two glass pieces you want to connect. Let’s assume you have access to a UV light and at least one of the pieces you wish to adhere is transparent. I would recommend using Loctite 349 UV curing adhesive (item #52270). This glue is transparent, wet or dry, and with proper lighting will dry very quickly. When applied it will remain wet, allowing you as much placement time as you need. Once everything is in place, a UV light (item #10090) should be applied for 1-5 minutes to give time for the glue to set. In order to cure, let sit for additional time or apply more UV light, and you will form a great glass to glass bond that is very difficult to remove. This is the best option, provided you’ve got the right equipment. If you do not have transparent glass, the UV light cannot penetrate through and curing will not take place. In times like these, you’ll have to turn to another product. Our Loctite 3494 (item # 30765) adhesive will cure under either UV or natural light settings. Although curing times are longer without UV light and you don’t get as strong a bond, it is nonetheless the best glue for applications involving opaque glass. If you are looking to glue glass to metal, I would recommend another glue, Loctite 319 (item # 194088). Primarily used by auto shops to adhere your rear view mirror to your windshield, this adhesive dries fast, is easy to apply, and holds fast. It will begin to grab in about one minute with no UV light required (however UV will catalyze the curing process). This transparent glue is useful for all glass to metal application. For those seeking to quickly and cheaply repair an ornamental piece of glass, I suggest the (item # glue) Loctite crystal clear glass glue. It is much like a super glue for glass. No special curing equipment is required other than time. This one does cure pretty fast, but is still no match for uv cure if you have access to a curing system. What if you’re gluing glass that’s going to be cold-worked or polished later on? Well, there are many options for you to choose from. 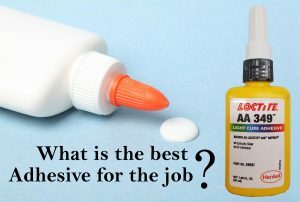 Indeed, our Loctite 349 UV curing adhesive (item # 52270) is recommended if you have a UV light (item #10090). For those without, or who would rather use a two part epoxy, we have a great substitution in Epoxy 330 (item # EPOXY330). Epoxy 330 is a clear bonding two part mix applied in a 1:1 ratio. Once mixed, the glue will begin to harden in approximately 15-20 minutes. After dry, Epoxy 330 can be lapidary worked and will remain completely clear without discoloring. This is an issue for some glues which are excellent for adherence properties, but when sanded become a yellowish mess on your artwork. In summary, whether you want to glue glass to glass or glass to metal, there is a right and a wrong answer. You must choose the right tool for the job.